You know when you read a post on a Mommy/Daddy blog and the whole thing is an excuse for the writer to brag about his/her kid’s intellect or athleticism? Don’t you just hate that? Good news! This will be the latest in a string of 260ish posts in which I do not brag about any of my kids’ prowess on an athletic field. Yes, I did post about my son’s first soccer goal, but that was more relief than boasting. The bad news is that there are two more boys coming along who may develop into star athletes, should lightning strike, and who knows that you won’t be showered with tales of their goals and touchdowns through the seasons of the future. But that’s for another day. For now, I will take the humble road and merely tell you how smart my kids are. 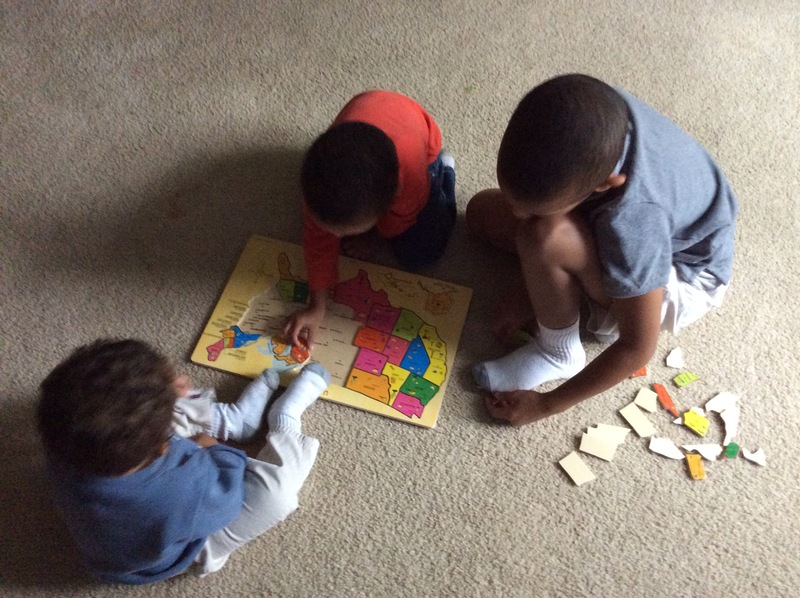 Big Brother was thrilled to receive his puzzle map and, being an eager student of geography, put it together immediately. 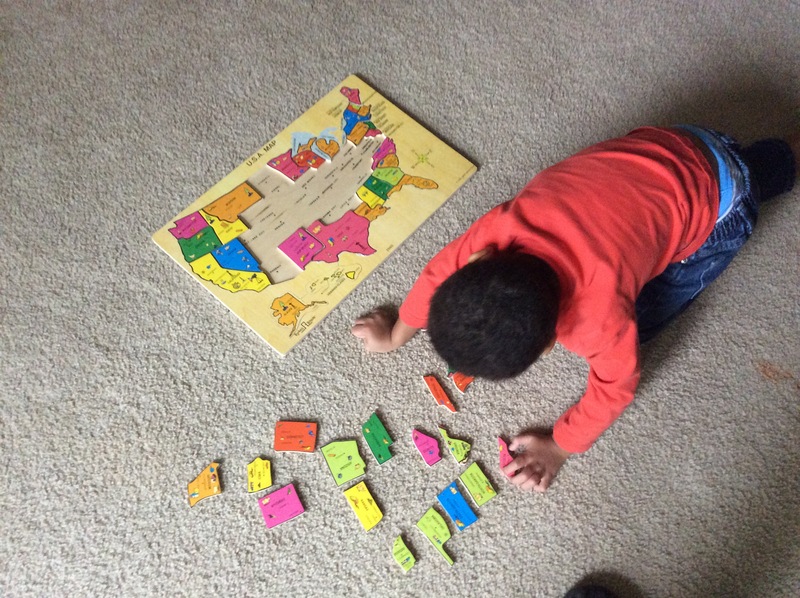 To challenge himself, he began putting it together with the pieces upside down. His enthusiasm for the map drew Buster’s attention. 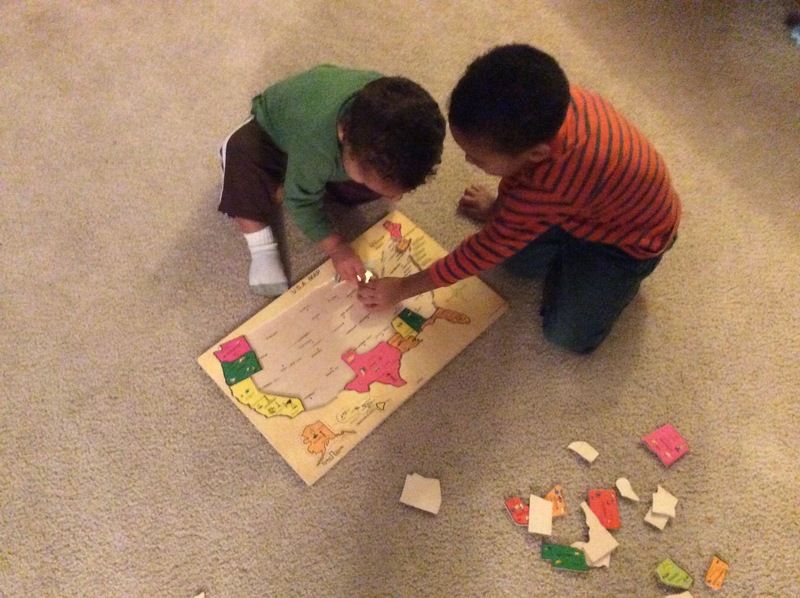 Before long, Big Brother was helping Buster put the map together. When you use the pieces upside down, it makes everything seem backwards too. Big Brother helps Buster learn the ropes. Big Man refrains from eating the pieces. Now, Buster doesn’t know the names of the states, or their capitals, like Big Brother does, but I’ll be damned if he hasn’t learned where a good many of them go. This is how much Buster can put together without any help. I would have been completely satisfied with this. It is more than enough to fill an entire post with cringe-worthy paternal pride. But Buster, his father’s son, finds joy in sharing knowledge. Like his father, he never let the fact that he only half knows what he’s doing prevent him from teaching somebody else how to do it. The world moves fast, and we can’t wait for them to wait for us to learn the whole thing. Buster has begun teaching Big Man how to put the United States together. As of last night, Big Man could put Michigan and Maine in the right spots. That may not seem like much, but it is almost 1/3 of the Ms, and the Ms pull as much weight as anybody, state-wise. Buster passes his learning on to Big Man. If this cycle retains its natural course, Big Man will soon pass on his knowledge to me. By this time next week, they’ll all know more about geography than I do. It’s a good thing I didn’t wait until I knew much about it to start teaching them, or maybe getting out of the way so they could learn it on their own. Anyway, aren’t you glad I used this post to objectively document intellectual progress rather than get all puffed out about my amazing kids? Don’t you just love it when a blog is all classy like that? This entry was posted in Random Toy Box and tagged boys, brothers, Dads, Education, family, fatherhood, geography, humor, puzzles, Sons. I’m going to need to stop my bragging long enough to go out and get them all some bigger britches. Funny kids will do that to you. Is that what I look like from where you sit? I would at least have had the good taste to extend my pinky finger, ever so gracefully. You’re too funny. Brag all you want! Those of us with kids understand the joy that is felt when our kids accomplish things. They’re great kids and it’s easy to see why they make you proud. Maybe next time I’ll take of the gloves and brag in earnest. Very well done of you to have such humility…..at least about your own knowledge of geography…..kudos to Big Brother asking for such a birthday gift….now that’s impressive! Well, it’s not like it was the only gift he asked for. There were plenty of things on his list that were somewhat less intellectually stimulating. Hey, he’s still a kid……am giving him alot of credit! Got to take what we do get along the way! Taking every bit that’s offered. The same place you find everything else in this world: Amazon. Awe, good boys! It’s nice to see kids playing with things that might also teach them a thing or two. Buster knows more about the M states than I do for sure, and I freaking live in Missouri. 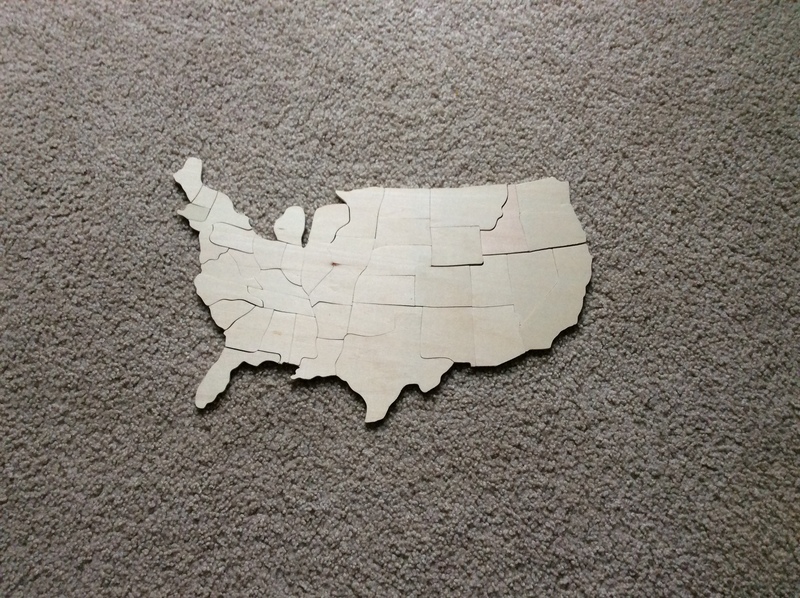 It’s easier to start with you home state when it’s on one of the outside edges of the puzzle. I feel sorry for you kids in Missouri and Kansas. Good to hear from you, Don. Hope all is well. Ha very classy! Now they’ll have to start with a Canadian puzzle. WAIT no! Then they’ll know more about Canada then this Canadian eh?! Exactly. I don’t want to have to buy new shirts, or worse, do any sewing. So I’d better stay humble.